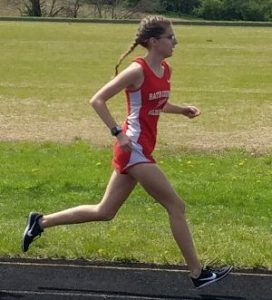 Junior TRACKCAT Isabella Copher won the 3200 Meter Run besting two Mason County runners in the last 200 meters to finish at 12:25.73. This mark beats the old SchoolRecord time of 12:31.08 and establishes a new SCHOOL RECORD. Isabella ran the majority of the race in the 3rd position just behind the leaders. With 200 meters left she moved in front and outran her opponents for the win and the Record. Her previous best 3200m time was establish last year same time-Same venue. Earning Top Finishes, Medals, and scoring points was Isabella Copher 3rd 1600m 5:41.88, Amelia Oldfield 1st 400m 1:03.43, Abby Henderson 2nd 800m 2:36.13, Amelia Oldfield 2nd 200m 27.70, Isabella Copher 1st 3200m 12:25.73, Amelia Oldfield – Mallory Brashear – Jaycie Bussell – Abby Henderson 3rd 4x400m Relay 4:50.82. 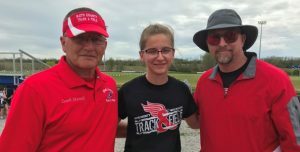 Madelyne English 1st Discus Throw 103-00.00, Madelyne English 1st Shot Put 30-07.00, Jaycie Bussell – Austin Bowling 2nd 2x50m Mixed Unified, Austin Bowling 2nd Mixed Unified Long Jump 8-03, Caleb Bowen 3rd 1600m 4:57.73, Caleb Bowen 2nd 800m 2:17.62, James Overholser 3rd 3200m 10:55.45, Taylor Purvis – Caleb Bowen – Owen St. John – James Overholser 3rd 4x400m Relay 4:02.08, Taylor Purvis 3rd High Jump 5-02.00. Taylor Purvis 2nd Pole Vault 11-00.00. The TRACKCATS next meet is the Eastern Kentucky Conference Championship on Saturday April 20 at the Morgan County Track.